The AARTOS DD system's mobile range sees two new additions in 2018. November 2018 - Over the past years, commercial micro and mini UAVs, known as 'drones', have become an almost common sight. With the technology becoming ever more affordable, a greater number of people uses these UAVs for different purposes – especially in amateur photography, drones have come to deliver spectacular results. Yet, with the emergence of this trend, potential dangers have surfaced as well. Government facilities, airports, power plants – these are just a few examples of critical infrastructure that relies heavily on secured airspace. In the past, UAVs have repeatedly penetrated no-fly zones without authorization. Furthermore, drones are becoming more and more capable of transporting potentially harmful payload. Since its introduction to the market in 2015, the range of Aaronia's AARTOS Drone Detection System has seen consistent and significant upgrading. Next to the stationary versions, Aaronia has expanded its mobile array with two new additions in 2018. The AARTOS DDS Container is a self-sustaining, remote-controllable system. The solid 5ft container in corrugated steel sheet metal (2200 x 1600 x 2445 mm) is an off-grid solution, powered by solar energy and an additional diesel generator, making it independent for up to three months in perfect conditions. It offers 24/7 360° RF drone detection and video object classifying through latest state-of-the-art analysis, and alarms can be immediately forwarded via push email or text message. The system is remote-controllable and allows access to live and historic video and drone detection feed via mobile network or satellite connection. If needed, a direct connection to the Security Guard Control Center adds security. 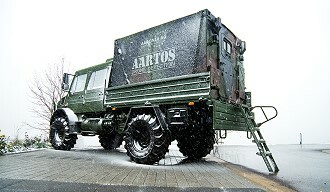 Next to the DDS Container, Aaronia now offers another solution for permanent deployment in the field, the Shelter. As the all-round carefree package for any drone detection operator, the Shelter combines all the advantages of the AARTOS DDS family with extreme sturdiness. Ready for action within 10-15 minutes, yet reliant on 2/2 external power supply, the system offers highly precise and reliable drone detection in even the most adverse weather conditions. At the basis of the Shelter is the AARTOS Command Center, acting as the master PC and providing everything that is necessary, including the RTSA Suite Pro software solution. Weighing less than 1000 kg, the Shelter's standard ISO dimensions (2900 x 1825 x 2050 mm) render it fit for transportation, be it with a Unimog or any suitable flat-bed pickup. Like the Container, the Shelter is compatible with the entire AARTOS DDS range, and can also be fitted with an A/C module. Highly scalable and easy to operate, both the Container and the Shelter can be set up and deployed in little time (10-15 minutes), making them ideal for surveillance and drone detection at events (concerts, parades, sport events etc. ), industrial plants, borders, airports, correctional facilities and military camps. As tailor-made solutions, individual components and features can be specifically fitted to customers' needs. Like all Aaronia products, the AARTOS DDS Container and Shelter adhere to the high quality standards associated with the label Made in Germany. Based in Germany, Aaronia AG designs and develops RF and MW test and measurement equipment. Founded in 2003 by CEO Thorsten Chmielus, the company's initial focus lay on spectrum analyzers, generators, antennas and shielding materials. Aaronia's main focus has since become the design and development of high-end drone detection and counter-UAV equipment based on RF signal detection. After four years of development, the AARTOS Drone Detection System was released in 2015. Now in its 3rd generation, the system and its range have been refined and expanded with every iteration. Aaronia's customer groups include government agencies such as police and military forces. All Aaronia products, both hard- and software, are designed and developed at the company's headquarters in Strickscheid, Germany.